From vast forgotten underground cities to an elaborate and shocking double-cross, Tony Cliff's Delilah Dirk and the Pillars of Hercules brings all the drama and excitement that fans of the series crave. Tony Cliff – a life-long resident of Vancouver, British Columbia – began his comics work as a contributor to the Flight series of anthologies. His first major published work, Delilah Dirk and the Turkish Lieutenant, is a NYT Bestseller, a Publishers' Weekly Best of 2013, and was nominated for Eisner, Shuster, and Harvey awards. 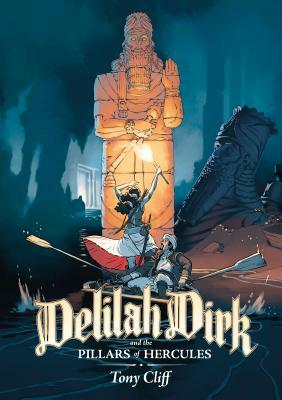 Delilah Dirk and the Third Pillar of Hercules will be the third book in the series, following 2016's similarly well-received The King's Shilling. He is strongly opposed to bios that conclude with one quirky attempt at humour.